This article is about the academy founded by Plato. For the 15th-century school in Florence, see Platonic Academy (Florence). 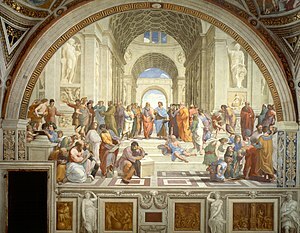 For the Raphael painting, see The School of Athens. The Academy (Ancient Greek: Ἀκαδημία) was founded by Plato (428/427 BC – 348/347 BC) in c. 387 BC in Athens. Aristotle (384–322 BC) studied there for twenty years (367–347 BC) before founding his own school, the Lyceum. The Academy persisted throughout the Hellenistic period as a skeptical school, until coming to an end after the death of Philo of Larissa in 83 BC. The Platonic Academy was destroyed by the Roman dictator Sulla in 86 BC. Map of Ancient Athens. The Academy is north of Athens. The Akademia was a school outside the city walls of ancient Athens. It was located in or beside a grove of olive trees dedicated to the goddess Athena, which was on the site even before Cimon enclosed the precincts with a wall. The archaic name for the site was Ἑκαδήμεια (Hekademia), which by classical times evolved into Ἀκαδημία (Akademia), which was explained, at least as early as the beginning of the 6th century BC, by linking it to “Akademos”, a legendary Athenian hero. The site of the Academy was sacred to Athena; it had sheltered her religious cult since the Bronze Age. The site was perhaps also associated with the twin hero-gods Castor and Polydeuces (the Dioscuri), since the hero Akademos associated with the site was credited with revealing to the brothers where the abductor Paris had hidden their sister Helen. Out of respect for its long tradition and its association with the Dioscuri – who were patron gods of Sparta – the Spartan army would not ravage these original ‘groves of Academe’ when they invaded Attica. Their piety was not shared by the Roman Sulla, who axed the sacred olive trees of Athena in 86 BC to build siege engines. Among the religious observances that took place at the Akademeia was a torchlit night race from altars within the city to Prometheus’ altar in the Akademeia. The road to Akademeia was lined with the gravestones of Athenians, and funeral games also took place in the area as well as a Dionysiac procession from Athens to the Hekademeia and then back to the city. The site of the Academy is located near Colonus, approximately, 1.5 kilometres (0.93 mi) north of Athens' Dipylon gates. The site was rediscovered in the 20th century, in the modern Akadimia Platonos neighbourhood; considerable excavation has been accomplished and visiting the site is free. Visitors today can visit the archaeological site of the Academy located on either side of the Cratylus street in the area of Colonos and Plato's Academy (Postal Code GR 10442). On either side of the Cratylus street are important monuments, including the Sacred House Geometric Era, the Gymnasium (1st century BC – 1st century AD), the Proto-Helladic Vaulted House and the Peristyle Building (4th century BC), which is perhaps the only major building that belonged to the actual Academy of Plato. What was later to be known as Plato's school probably originated around the time Plato inherited the property at the age of thirty, with informal gatherings which included Theaetetus of Sunium, Archytas of Tarentum, Leodamas of Thasos, and Neoclides. According to Debra Nails, Speusippus "joined the group in about 390 BC". She claims, "It is not until Eudoxus of Cnidos arrives in the mid-380s BC that Eudemus recognizes a formal Academy." There is no historical record of the exact time the school was officially founded, but modern scholars generally agree that the time was the mid-380s, probably sometime after 387 BC, when Plato is thought to have returned from his first visit to Italy and Sicily. Originally, the meetings were held on Plato's property as often as they were at the nearby Academy gymnasium; this remained so throughout the fourth century. Though the Academic club was exclusive and not open to the public, it did not, at least during Plato's time, charge fees for membership. Therefore, there was probably not at that time a "school" in the sense of a clear distinction between teachers and students, or even a formal curriculum. There was, however, a distinction between senior and junior members. Two women are known to have studied with Plato at the Academy, Axiothea of Phlius and Lasthenia of Mantinea. Plato's Academy is often said to have been a school for would-be politicians in the ancient world, and to have had many illustrious alumni. In a recent survey of the evidence, Malcolm Schofield, however, has argued that it is difficult to know to what extent the Academy was interested in practical (i.e., non-theoretical) politics since much of our evidence "reflects ancient polemic for or against Plato". It is believed that above the door of Plato's Academy was written Ἀγεωμέτρητος μηδεὶς εἰσίτω ("Let no one ignorant of geometry enter"). Diogenes Laërtius divided the history of the Academy into three: the Old, the Middle, and the New. At the head of the Old he put Plato, at the head of the Middle Academy, Arcesilaus, and of the New, Lacydes. Sextus Empiricus enumerated five divisions of the followers of Plato. He made Plato founder of the first Academy; Arcesilaus of the second; Carneades of the third; Philo and Charmadas of the fourth; and Antiochus of the fifth. Cicero recognised only two Academies, the Old and New, and had the latter commence with Arcesilaus. "Old Academy" redirects here. For the building in Munich, see Old Academy (Munich). Plato's immediate successors as "Scholarch" of the Academy were Speusippus (347–339 BC), Xenocrates (339–314 BC), Polemon (314–269 BC), and Crates (c. 269–266 BC). Other notable members of the Academy include Aristotle, Heraclides, Eudoxus, Philip of Opus, and Crantor. Around 266 BC Arcesilaus became Scholarch. Under Arcesilaus (c. 266–241 BC), the Academy strongly emphasized a version of Academic skepticism closely similar to Pyrrhonism. Arcesilaus was followed by Lacydes of Cyrene (241–215 BC), Evander and Telecles (jointly) (205 – c. 165 BC), and Hegesinus (c. 160 BC). The New or Third Academy begins with Carneades, in 155 BC, the fourth Scholarch in succession from Arcesilaus. It was still largely skeptical, denying the possibility of knowing an absolute truth. Carneades was followed by Clitomachus (129 – c. 110 BC) and Philo of Larissa ("the last undisputed head of the Academy," c. 110–84 BC). According to Jonathan Barnes, "It seems likely that Philo was the last Platonist geographically connected to the Academy." When the First Mithridatic War began in 88 BC, Philo of Larissa left Athens and took refuge in Rome, where he seems to have remained until his death. In 86 BC, Lucius Cornelius Sulla laid siege to Athens and conquered the city, causing much destruction. It was during the siege that he laid waste to the Academy, as Plutarch relates: "He laid hands upon the sacred groves and ravaged the Academy, which was the most wooded of the city's suburbs, as well as the Lyceum." The destruction of the Academy seems to have been so severe as to make the reconstruction and re-opening of the Academy impossible. When Antiochus returned to Athens from Alexandria, c. 84 BC, he resumed his teaching but not in the Academy. Cicero, who studied under him in 79/8 BC, refers to Antiochus teaching in a gymnasium called Ptolemy. Cicero describes a visit to the site of the Academy one afternoon, which was "quiet and deserted at that hour of the day". Despite the Platonic Academy being destroyed in the first century BC, the philosophers continued to teach Platonism in Athens during the Roman era, but it was not until the early 5th century (c. 410) that a revived academy (which had no connection with the original Academy) was established by some leading Neoplatonists. The origins of Neoplatonist teaching in Athens are uncertain, but when Proclus arrived in Athens in the early 430s, he found Plutarch of Athens and his colleague Syrianus teaching in an Academy there. The Neoplatonists in Athens called themselves "successors" (diadochoi, but of Plato) and presented themselves as an uninterrupted tradition reaching back to Plato, but there cannot have actually been any geographical, institutional, economic or personal continuity with the original academy. The school seems to have been a private foundation, conducted in a large house which Proclus eventually inherited from Plutarch and Syrianus. The heads of the Neoplatonic Academy were Plutarch of Athens, Syrianus, Proclus, Marinus, Isidore, and finally Damascius. The Neoplatonic Academy reached its apex under Proclus (died 485). The last "Greek" philosophers of the revived Neoplatonic Academy in the 6th century were drawn from various parts of the Hellenistic cultural world and suggest the broad syncretism of the common culture (see koine): Five of the seven Academy philosophers mentioned by Agathias were Syriac in their cultural origin: Hermias and Diogenes (both from Phoenicia), Isidorus of Gaza, Damascius of Syria, Iamblichus of Coele-Syria and perhaps even Simplicius of Cilicia. In 529 the emperor Justinian ended the funding of the revived Neoplatonic Academy. However, other philosophical schools continued in Constantinople, Antioch, and Alexandria, which were the centres of Justinian's empire. The last Scholarch of the Neoplatonic Academy was Damascius (d. 540). According to Agathias, its remaining members looked for protection under the rule of Sassanid king Khosrau I in his capital at Ctesiphon, carrying with them precious scrolls of literature and philosophy, and to a lesser degree of science. After a peace treaty between the Persian and the Byzantine empire in 532, their personal security (an early document in the history of freedom of religion) was guaranteed. ^ Plutarch. Life of Cimon, xiii:7. ^ Plutarch. Life of Theseus, xxxii. ^ Plutarch. Life of Solon, i, 7. ^ Herbert Ernest Cushma. (1910). A Beginner's History of Philosophy, Volume 1, pg 219. Houghton Mifflin. ^ Ainian, A.M. & Alexandridou, A. (2007). The “sacred house” of the Academy revisited. Acts of an International Symposium in Memory of William D.E. Coulson. Volos, Greece: University of Thessaly. ^ pp. 5–6, D. Nails, "The Life of Plato of Athens", in H. Benson (ed. ), A Companion to Plato, Blackwell Publishing 2006. ^ pp. 19–20, W. K. C. Guthrie, A History of Greek Philosophy, vol. 4, Cambridge University Press 1975; p. 1, R. Dancy, "Academy", in D. Zeyl (ed. ), Encyclopedia of Classical Philosophy, Greenwood Press 1997. I. Mueller gives a much broader time frame – "...some time between the early 380s and the middle 360s..." – perhaps reflecting our real lack of evidence about the specific date (p. 170, "Mathematical Method & Philosophical Truth", in R. Kraut (ed. ), The Cambridge Companion to Plato, Cambridge University Press 1992). ^ D. Sedley, "Academy", in the Oxford Classical Dictionary, 3rd ed. ; p. 4, J. Barnes, "Life and Work", in The Cambridge Companion to Aristotle, Cambridge University Press 1995; J. Barnes, "Academy", E. Craig (Ed. ), Routledge Encyclopedia of Philosophy, Routledge 1998, accessed 13 Sept 2008, from http://www.rep.routledge.com/article/A001. ^ p. 31, J. Barnes, Aristotle: A Very Short Introduction, Oxford University Press 2000. ^ p. 170, Mueller, "Mathematical Method & Philosophical Truth"; p. 249, D. Nails, The People of Plato, Hackett 2002. ^ pp. 170–171, Mueller, "Mathematical Method & Philosophical Truth"; p. 248, Nails, The People of Plato. ^ p. 2, Dancy, "Academy"; p. 21, Guthrie, A History of Greek Philosophy, vol. 4; p. 34–36, Barnes, Aristotle: A Very Short Introduction. ^ p. 22, Guthrie, A History of Greek Philosophy, vol. 4. ^ pp. 170–71, Mueller, "Mathematical Method & Philosophical Truth". ^ M. Schofield, "Plato", in E. Craig (Ed. ), Routledge Encyclopedia of Philosophy, Routledge 1998/2002, retrieved 13 Sept 2008, from http://www.rep.routledge.com/article/A088 ; p. 32, Barnes, Aristotle: A Very Short Introduction. ^ Simplicius, Commentary on Aristotle's "On the Heavens" 488.7–24, quoted on p. 174, Mueller, "Mathematical Method & Philosophical Truth". ^ p. 23, Guthrie, A History of Greek Philosophy, vol. 4; G. Field, "Academy", in the Oxford Classical Dictionary, 2nd ed. ^ p. 293, "Plato & Practical Politics", in Schofield & C. Rowe (eds. ), Greek & Roman Political Thought, Cambridge University Press 2000. ^ "Academy", E. Craig (Ed. ), Routledge Encyclopedia of Philosophy, Routledge 1998, accessed 14 Sept 2008, from http://www.rep.routledge.com/article/A001. ^ a b c Gerald Bechtle, Bryn Mawr Classical Review of Rainer Thiel, Simplikios und das Ende der neuplatonischen Schule in Athen. Stuttgart, 1999 (in English). ^ The Cambridge Ancient History, (1970), Volume XIV, page 837. Cambridge University Press. Wikimedia Commons has media related to Platonic Academy. Wikisource has the text of a 1911 Encyclopædia Britannica article about Platonic Academy. "Academy" . Collier's New Encyclopedia. 1921. This page was last edited on 10 April 2019, at 22:38 (UTC).